Not taking medications as prescribed is dangerous, costly and affects virtually every family. We manufacture and sell personal care electronics / medication reminder devices for individual patients, hospitals, pharmaceutical (clinical studies) and the biotech industry. 125,000 people die every year due to not taking medications as prescribed by their doctors (over ten times those who die from illegal drug abuse). Learn about patient compliance and how to improve medication adherence. ....and remember that a common reason for medication non-compliance (poor medication adherence / poor patient compliance) is patients simply forget to take their medications. Diane came up with the idea for the CADEX medication reminder pill timer alarm and medical alert watch ("e-pill CADEX Alarm Watch") after watching her Mom deal with repeated heart problems because she forgot to take her medications. My mother was repeatedly sick and often anxious because she could not keep up with the timing of her medications," says Barker. "At that time there were no reminder systems available to patients like my mother. Ten years later, Barker introduced the CADEX 12 ALARM Medication Reminder and Medical ALERT Watch. "My goal is to sell an affordable, attractive reminder alarm watch to help people like my mother deal with their daily medication schedules." In the years since the product was launched, clinics, pharmacies, drug stores, pharmaceutical companies, hospitals, catalogues and individuals have ordered the watch. A patent (Medical Information Appliance US 6,560,165) was granted in 2003. Now with over 50,000 satisfied users (patients), most say the CADEX Watch is the best pill timer (medication reminder device) on the market today. Reviews of the CADEX 12 ALARM Medication Reminder & Medical ALERT Watch can be found in Health Magazine, Pharmacy Times, Retail Pharmacy News, Bottom Line, Home Health Products, U.S. Pharmacist, Advance Nurse Practitioner, Reader's Digest as well as over 60 hospital newsletters and newspapers nationwide. It was also awarded Member Tested & Recommended Seal of Approval by Health & Wellness Magazine. CADEX on TV. Today the e-pill CADEX is recommended by GOOD HOUSEKEEPING. The CADEX line of medical devices was acquired by the Boston based medical device company e-pill, LLC (e-pill® Medication Reminders) in 2006. 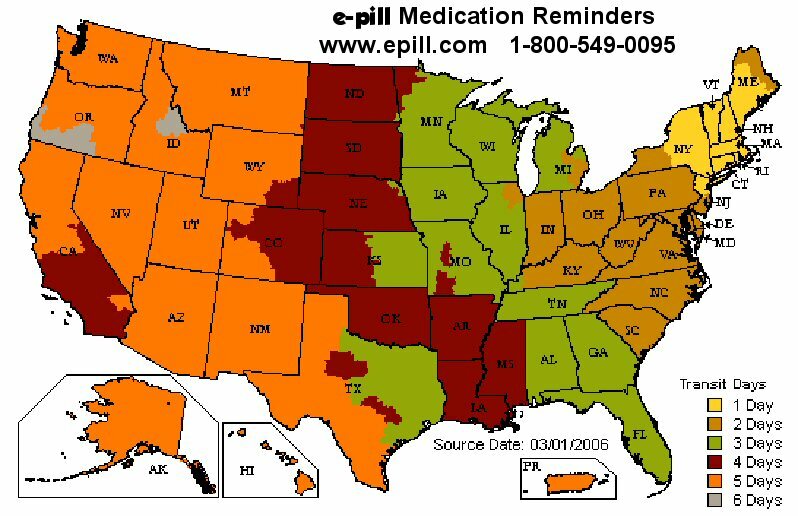 Click here for a complete listing of all e-pill® Medication Reminders. STANDARD (FREE Shipping): All e-pill Medication Reminder products are shipped free (US only) by Standard Shipping (we choose shipping method). Please make sure you select STANDARD SHIPPING at CHECK-OUT. Act NOW - Order Today & Get FREE Standard Shipping on any size order for all U.S. Customers! UPS GROUND: Customers may also request that the order be shipped by UPS Ground Residential or UPS Ground Commercial. Select you shipping method at check-out. US customers only (48 contiguous states only). Tracking is available. Flat rate $7.95 per order. UPS Ground Shipping Time estimator. INTERNATIONAL: Shipping to non-USA customers: A $15.00 per order charge will be added to your order at check-out. Overnight / 2nd Day Air / UPS Ground shipping is NOT available to customers outside the USA. We ship all international orders via USPS (United States Postal Service) International Priority Mail. Expect 14 days delivery time. No tracking information is available. Customer is responsible for any Sales Tax / VAT or Customs Duties. PAYMENT We accept: MasterCard, VISA, AMEX, Discover, Diner's Club and PayPal.